News site Motherboard found conspiracy theories and fake news topped search suggestions, when looking for clips of the California wildfires. It said YouTube had “not adequately stopped these conspiracy theories from blossoming on its platform”. YouTube said it has made a long-term commitment to tackle misinformation. 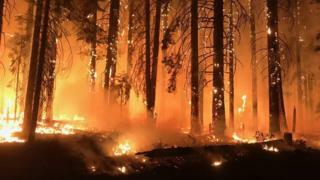 At least 80 people have died in the fires which swept across the state of California in November. 500 people remain unaccounted for after the so-called Camp Fire destroyed the town of Paradise. But YouTube has provided a “thriving” home for misinformation about the fires, Motherboard said. It found people searching for the fire were recommended topics such as “conspiracy 2018”, “directed energy weapon” and “laser beam”. Many of the conspiracy videos falsely suggest the fires were deliberately lit with plane-mounted laser weapons. They use manipulated or out-of-context images to back their arguments. YouTube has been criticised for struggling to limit the spread of fake news and misinformation on the platform. Its recommendations and search results are powered by algorithms that have been manipulated by video-makers to help their content go viral. Critics have complained that YouTube’s algorithms serve up progressively more sensationalist and reactionary content. But YouTube told Motherboard it had a breaking news section on its homepage, which draws videos from reliable sources. This is not the first time YouTube and its parent Google have been accused of serving up the very opposite of useful and accurate information. Asked whether Barack Obama was planning a coup, the Google Home smart speaker used to pipe up with a conspiracy theory from some dubious site. More recently, YouTube was accused of leading high school students who typed “federal reserve” into its search box as they researched a homework assignment down a rabbit hole of “conspiratorial quackery” with increasingly paranoid videos. Google is constantly tweaking its search algorithm to make sure it produces better results, but it is facing an army of opponents determined to skew it in a different direction for commercial or malicious purposes. What is more disturbing is the way the algorithm appears to latch on to a person’s fears and prejudices, recommending ever more extreme content rather than leading them back towards the truth. Earlier this year, YouTube chief executive Susan Wojcicki promised action against fake news – not by changing the algorithm, but instead providing links to Wikipedia articles debunking conspiracy theories alongside videos. I just searched for “chemtrails”, one of the subjects she mentioned, and the first result was a conspiracy theory video. There were plenty more in the “up next” bar alongside it. But no sign of Wikipedia. While Facebook has received much of the blame for the dissemination of fake news, YouTube may be a more influential platform among young people. Now it stands accused of feeding them a twisted and unreliable view of the world.